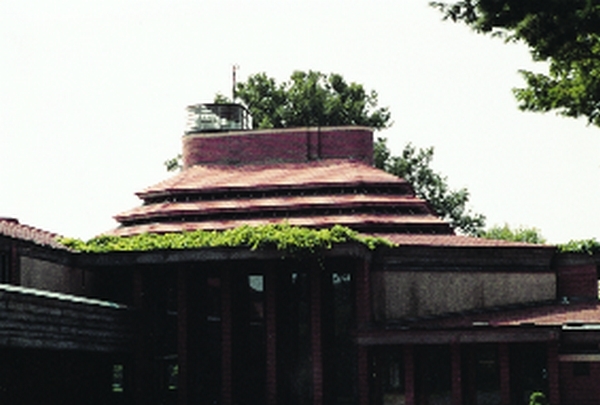 In Epoxyworks Number 7 I wrote The Structural Repair of Wingspread about engineering and construction involved in the structural stabilization a Frank Lloyd Wright-designed house in Racine, Wisconsin. At that time, the East Wing of the house was undergoing stabilization. Now, one year later*, work on the East Wing is complete and work is progressing on the Great Hall. The cast of characters remains the same for this phase of the project as it was for the East Wing. Robert Silman Associates, Inc. is the project engineer. Bentley & Son Construction Services is the general contractor and Palmer Johnson, Inc., a yacht builder, provides the laminating crew. Except for some minor differences, the technique for stabilizing the roof of the Great Hall is essentially the same as it was for the East Wing. A thick, stiff carbon fiber membrane is installed on top of the roof sheathing. Large wood screws potted in epoxy transfer the shear loads from the membrane to the roof joists. The membrane/potted fastener arrangement minimizes movement in the roof structure, which in turn reduces outward pressure on the walls. The architects suggested working on the East Wing of the house first as kind of a “rehearsal” for the more complex job of repairing the Great Hall. The Great Hall roof is octagonal with a band of skylights that separates the upper roof from the lower roof. The majority of the construction is taking place on the lower section of roof in the skylight area. The most impressive aspect of the site is the temporary structure fabricated over the Great Hall to keep the construction area warm and dry while work progresses. The Great Hall has 2,400 square feet of floor space and a ceiling height approaching twenty-five feet. The temporary shelter covers this area and gives the construction crew a minimum of nine feet of head room with no intermediate roof support posts. A couple of temporary gas furnaces provide enough heat to keep the building warm and provide sufficient heat to cure the epoxy laminate. 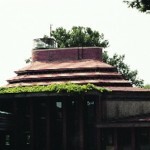 As on the East Wing, the stabilization project began by removing the terra cotta roof tiles and cleaning the roof sheathing to expose fresh, bare wood. In addition, the crew removed the skylights so they could be re-glazed and also to facilitate installing new structural beams to connect the upper and lower roof. Then the construction crew from Bentley & Son Construction Services installed large wood screws set in epoxy through the roof sheathing boards and into the joists. At a rate of one screw every six inches on each joist, they installed several thousand fasteners. 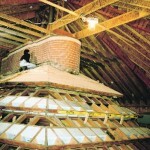 Between each vertical row of skylights, Wright specified a 2″ x 4″ framework. The purpose of the framework was to provide an anchorage for the skylight trim and to provide a rigid connection between the top roof and lower roof. Over the years, the nails holding the framework together pulled loose and allowed movement between the two roof sections. The engineers at Silman and Associates recommended replacement of several frames and repair of the remainder. The new frames were made from one of two materials, depending on the anticipated load. The engineers chose aircraft grade aluminum for use in the highly loaded areas and laminated veneer lumber augmented with carbon fiber for areas where loads were lower. Each beam has a unique shape, so the Bentley crew made a template for each one and had the aluminum cut to shape off site. 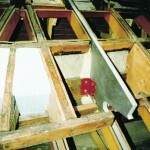 The photograph shows the complicated shape of each beam. The general contractors once again enlisted the fiberglass laminating crew from Palmer Johnson Inc. to install the carbon fiber membrane on the roof. The carbon fiber is a 30 ounce per square yard quadraxial fabric. The finished carbon fiber membrane is 1/2″ thick and required eight layers of the fabric to achieve that thickness. PRO-SET® Epoxy was used for laminating and applied to the fabric with an air driven impregnator. The orientation of the fabric fibers is very important, and keeping them lying in the proper direction on an octagonal roof was no easy matter. All the parties involved with the membrane installation put their heads together and came up with a detailed drawing specifying how each layer of fabric had to be cut and fit in order to maintain the proper fiber orientation and the proper overlap with the adjacent piece. Once the Palmer Johnson crew finished installing the carbon fiber/epoxy membrane, site superintendent Kevin Higgs draped insulating blankets over the top of the membrane and pumped heat under them. He was able to raise the temperature of the membrane to 140°F for eight hours to post cure the PRO-SET Epoxy. Baking the PRO-SET material allows it to develop additional strength when compared to room temperature cured material. Currently the crew is re-glazing the skylights in preparation for reapplying the roof tiles. 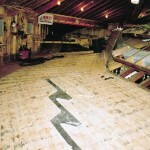 Higgs hopes to have the project completed and the site cleaned up by May, 1997. The roof of the Great Hall under the temporary shelter. Skylights and roof tiles are removed. One of the aluminum frames cut to replace a specific 2″x4″ frame between skylights. The roof sheathing has been refastened to the joists with large screws bonded with epoxy. An aluminum frame installed to help support the skylight area between the upper and lower roofs.